INDIANAPOLIS -- There will be no tolling on Indianapolis-area interstates if two Indiana state senators' bill becomes law. The idea to toll I-465 was floated by the Indiana Department of Transportation in an October tolling study, which was required under a transportation bill approved in 2017. The study focused on I-65 and I-70 across the state, but INDOT said it also wanted to take a closer look at possible tolls on I-465 around Indy. That thought was met with immediate backlash among Indianapolis residents and state lawmakers. State Senator Mike Delph (R-Carmel) sent a series of tweets in October, criticizing the idea of tolling I-465 and promised to introduce legislation to stop it from happening. I-465 on the westside is the main north south corridor. Increased gas taxes + new tolling=double taxation. Still can't believe some GOP leaders find this type of public policy making acceptable. It's offensive! The fact remains the IGA is extremely driven by paid well financed special interests. They buy Rs & Ds off. It's remarkable & truly sad! Delph kept his promise with the beginning of the 2018 legislative session. He, along with Sen. Michael Young (R-Marion and Hendricks counties), authored a bill that would keep tolling away from any interstate within 15 miles of Monument Circle. 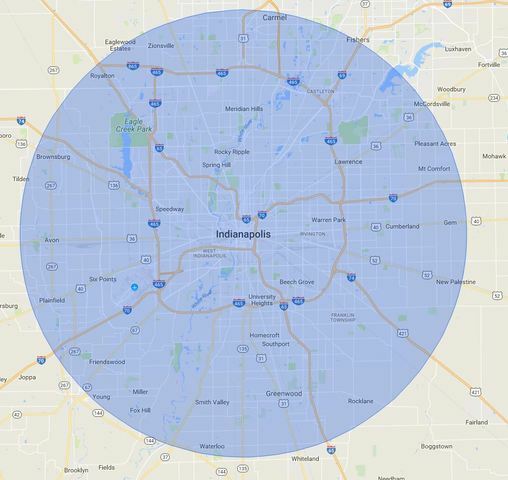 The 15-mile radius would cover all of I-465, I-65 south to Whiteland and north to I-865, I-70 west to Plainfield and east to Mt. Comfort, I-74 west to Brownsburg, and I-69 northeast to Fishers. To read the full bill, click here.